Hocus Focus Productions - Free 3D too Be sure to check out "Dark, Deadly, Dimensions" You need 3D glasses to enjoy this stuff!Get `em here! 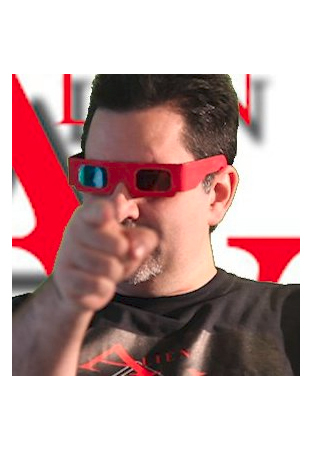 Be sure to check out "Dark, Deadly, Dimensions"
You need 3D glasses to enjoy this stuff! In order to help the video pages load faster, we're adding more so each page can host fewer videos. Here we will be adding MORE 3D content as HFP creates it. And if you need a bigger 3D fix, check out our work at www.bcinema.tv and ﻿﻿﻿Fangoria's Fangovision ﻿page. n the 1920 film, "The Golem", Rabbi Loew creates a man of clay and needs to compel the powers of darkness to reveal their secrets so that he may bring the creature to life. We have recently converted this film to 3D are in the process of adding a score comprised of royalty free, cleared music. Building the score will take some time using fragments like this. This scene seemed to have the potential to use a more modern feeling music with a heavier, quick sound. So, for your enjoyment, in 3D, a scene from, "The Golem". Works with red and blue glasses.